This Bible is attractive from cover to cover!The padded hardback cover depicts an illustration of Airship Genesis ready to take on a Bible adventure. 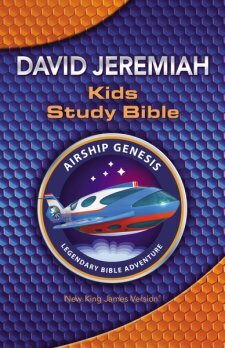 There's a "Welcome to the Airship Foreword" by David Jeremiah, in which kids are encouraged to read the Bible, get to know the characters and most importantly, come to know Jesus as their Lord, Savior, and Friend. The Genesis Exploration Squad, comprised of five young adventurers, will help your child discover new adventures in the pages of this Bible and sets off on a journey they'll never forget. The five explorers consist of three boys and two girls, as well as, RUPERT, the artificial intelligence guide and JOULES, a playful, funny monkey. 13 Full Color Maps that help bring the Bible to life. It contains the whole text of the New King James Bible version. I am very impressed with this Bible. The colorful, captivating way it is organized makes it exciting for kids and will grab any child's attention. Besides, all the interesting sidebars, articles, and other information, it also includes frequently dispersed full size, full color, illustrations of various Bible Characters, that will bring the stories to life. I highly recommend this Bible for ages 8-12. Any child who is able to read for himself, will find this an engaging journey to embark on!